I, as the accountable authority of the Australian Electoral Commission (AEC), present the 2018–2022 Corporate Plan, which covers the period 2018–2022, as required under paragraph 35(1)(b) of the Public Governance, Performance and Accountability Act 2013. Welcome to the Australian Electoral Commission (AEC) 2018–2022 Corporate Plan, which sets our strategic direction for the next four years. We are making significant progress in our modernisation journey as we continue to innovate and meet the challenges of our complex operating environment. The AEC’s values of professionalism, agility, quality and electoral integrity remain highly relevant as we continue to progress. Our 2018–2022 Corporate Plan details our six agency directions and describes how they will enable us to deliver our purpose and ensure an efficient, effective and secure electoral system for Australia. This year, we have enhanced our performance reporting framework and the six agency directions have been expanded. These now include intention statements to better reflect the outcomes we are trying to achieve. We have also included important context about our operating environment, risks and capability to set the scene for our corporate plan, and the activities we have committed to undertake for each agency direction. One of our flagship initiatives is the modernisation of our two main election systems, which are critical to delivering our purpose and the stewardship of the electoral process. We are working closely with our stakeholders to ensure we can build new systems with sufficient agility to respond to future changes in legislation and policy. Our workforce is another vital component of the electoral process and is critical to delivering our purpose. We will continue to invest heavily in training and support for both our regular APS employees and our large temporary election workforce. Our corporate plan is designed to guide us further on our modernisation journey and is an integral part of our performance and reporting framework. This plan will assist the AEC to maintain an efficient, effective and secure Australian electoral system. This is the AEC’s corporate plan for 2018–2022. The information below provides a high-level outline of the elements in our plan and what they mean. Subsequent pages explore these elements in more detail and show how they work together to deliver our purpose. Our corporate plan sets the AEC’s strategic direction over a four-year period. Our purpose is to maintain an impartial and independent electoral system for eligible voters through active electoral roll management, efficient delivery of polling services, and targeted education and public awareness programs. Our agency directions are our medium to long-term objectives. They guide what we do, how we prioritise and how we promote continuous improvement. Our functions enable us to deliver our purpose. Our activities enable us to deliver our functions and are guided by our agency directions. Our environment outlines the factors or influences that may impact the operating of our agency and how we deliver our purpose. Our risks outlines potential issues or threats we need to mitigate to ensure we deliver our purpose. Our capability includes our people, processes and the systems we need to deliver our purpose. Our performance outlines the results and level of performance expected in meeting our agency directions, and through them, our purpose. Maintain an impartial and independent electoral system for eligible voters through active electoral roll management, efficient delivery of polling services, and targeted education and public awareness programs. Build an agile and responsive organisation. Each agency direction is explained in our performance below. Ensuring confidence in the electoral roll. Conducting successful electoral events, including federal elections, by-elections, referendums and industrial and commercial elections. Undertaking education and public awareness activities. Administering political party registrations and financial disclosure. Our activities are the tasks and projects we complete to achieve outcomes against each direction. Our activities are guided by our agency directions and are listed in more detail against individual directions in this corporate plan. This year marks 100 years since the Commonwealth Electoral Act 1918 (Electoral Act) was enacted. Since then, the expectations of our stakeholders and the way in which the AEC conducts elections continues to evolve, presenting a complex and dynamic operating environment for the AEC. 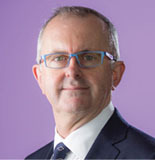 The Australian electoral system presents a number of unique challenges. With no fixed date for federal elections we must be ready to deliver an electoral event at any point in the electoral cycle. We do this through effective election planning and balancing the appropriate level of ‘election readiness’ with our financial environment. Australians travel an increasing amount for both work and leisure and expect to be able to vote how and where it is convenient to them. This needs to be considered in election planning. The AEC remains acutely aware of greater demands for more accessible and convenient voting options. The AEC goes above and beyond to provide early, postal, inter-division and interstate, mobile and overseas voting options and services. Comprehensive preparations and planning ensure that we are able to deliver these often logistically complex voting options with the appropriate number of ballot papers, materials and temporary workforce in place to enable a seamless and nationally consistent voter experience. Demand for these voting services continues to grow as our population increases. Advances in technology provide opportunities for the AEC to reinvent and evolve the way we conduct our business. The AEC continues to seize opportunities to incorporate technological solutions to deliver more efficient electoral events and internal processes, better manage the health and safety of our staff, and provide a voting experience in-line with stakeholder expectations—all while actively managing the associated challenges and risks. The Electoral Act outlines a highly prescriptive process for the conduct of elections which must be balanced with evolving technological, demographic and stakeholder demands for error free, transparent, modern and efficient electoral events. This presents the AEC with an ongoing challenge which we methodically and strategically manage through the six agency directions outlined in this plan. To ensure we can continue to deliver effective and secure elections into the future, we need to continue to modernise our systems and processes to adapt to change. We also need to recruit, train and support a professional workforce. Our work is guided by the AEC’s values of electoral integrity through professionalism, quality and agility. These inform the agency’s strategic planning and day-to-day operations. Our values frame how AEC staff work to maintain our commitment to electoral integrity. Quality must be evident in every task across the AEC. Best practice drives every aspect of our business. Agility is critical. We must readily and swiftly adapt to change. We must operate effectively despite uncertainty, always looking for innovative solutions to meet our challenges. Professionalism is our hallmark. 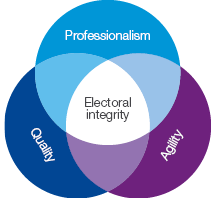 A professional AEC comprises competent, knowledgeable and highly skilled electoral practitioners producing work of the highest standard. IT systems and infrastructure are key to our delivery of electoral events. However, our core election and enrolment systems are ageing and costly to maintain. our systems are agile and adaptable. we use a single modern platform. IT is fully integrated and sustainable, widely used, understood and user-intuitive. our systems meet the expectations of our stakeholders and our workforce. Implementation of the 36 mandatory requirements of the Protective Security Policy Framework (PSPF) frames the way we manage challenges to our governance, personnel, physical and information security. In addition, we continue to work closely with government, security and policing agencies in response to events in the external environment. The AEC’s workforce is integral to the delivery of successful electoral events. With an office network of APS officers across Australia and a ‘surge’ workforce of around 80,000 at a federal election, the AEC is focused on ensuring that staff are appropriately trained and supported. Following implementation of an organisational design review, our new structure allows us to continue delivering high quality electoral services, while ensuring we have the required capability to address future objectives. As part of the review, a national training and education unit was established to ensure we deliver on our strategic priority to professionalise our workforce. Risk management is an important part of the work we do. We are committed to effective governance that recognises potential threats and opportunities, while managing strategic and enterprise risks in line with our risk appetite. Our risk management policy outlines how we identify and manage risks, including roles and responsibilities. Regular reporting and analysis, and the escalation of risk exposures, help to build a culture where risk conversations are part of our everyday decision making. Inability to meet increasing community expectations for voter-centric electoral services leads to decreased engagement in elections. Opportunities exist to modernise the Australian electoral service model through learning and collaboration across jurisdictions. Insufficient fiscal and human resources. Failure to maintain integrity in electoral roll information. Failure to maintain integrity in election results through a loss of ballot papers or other means. Failure to adequately educate voters may contribute to a decline in voting participation and/or formality. Failure to seize opportunities to modernise future models of election delivery due to resource constraints. Failure to build new technology applications with sufficient agility to respond to future changes in electoral legislation and policy. Failure to detect and prevent cyber and/or physical security threats. Failure to align funding and resource allocation against AEC priorities. Inability to maintain and/or obtain a capable and trained APS and surge temporary workforce. Failure to engage effectively with key stakeholders on critical issues that affect the reputation of the AEC. Unsuccessful in managing stakeholder expectations leading to adverse outcomes. Inability to effectively implement change. Inability to meet voter expectations within the Electoral Act. Since the 2017–2021 corporate plan, we have reviewed and redeveloped an AEC Performance Reporting Framework. This guides our approach to developing, managing and reporting on our performance information. Our performance framework is reviewed each year in line with the Public Governance, Performance and Accountability Act 2013 (PGPA) reporting cycle. Our performance framework links to internal planning and reporting to ensure performance priorities are agreed and reported on, both internally and externally. Each phase of the election readiness framework directs the activities to be undertaken, and the performance measures for the year. While we must always be ready to deliver an electoral event, 2017–18 was an ‘implement change’ year. In 2018–19, we will move into the ‘mobilisation’ phase towards the delivery of the next federal election. Post this event we will move into the ‘evaluate and learn’ phase. We provide the public and our stakeholders with the best possible electoral services including, enrolment, election delivery, political party registration, and funding and disclosure. We maintain public awareness of electoral matters and voting obligations through effective communication and targeted education and community engagement activities. Delivering electoral services is a key democratic process which must comply with the Electoral Act and relevant legislation. Electoral services must have integrity. They must be fair, impartial and apolitical, consistent with the AEC Service Charter and election service plans. An increasing and more mobile population with changing expectations of how and where they vote; different voting methods support accessibility. The need for electoral information and the obligation to enrol and vote to be understood in the Australian community, including communities and groups that may face barriers to participation. Information and services to political parties and candidates must comply with the Electoral Act. Maintaining nationally consistent service delivery in line with the AEC Service Charter. Being responsive to public scrutiny and the evolving external environment. Delivering services that are responsive to modernisation and change. Increasing our ability to use evidence and data to guide and improve service delivery. Delivering electoral events in accordance with legislation, the AEC’s event strategy and the election service plan. Actively managing the electoral roll throughout the electoral cycle. Supporting the timely conduct of electoral redistributions. Delivering joint roll services to state and territory electoral commissions in accordance with memorandums of understanding. Delivering impartial public information to inform eligible voters of their obligation to enrol, vote and how to cast a formal ballot. Using an evidence based approach, develop strategies for engaging with communities and groups that may face barriers to enrolment and electoral participation. Developing a digital portal to more efficiently engage with political parties as they carry out their legislative responsibilities and obligations. Delivering industrial elections, protected action ballots and fee for service elections in accordance with relevant legislation and rules. The model for delivering electoral events is robust, nationally consistent and built for continual evolution through all phases of the electoral cycle – maintaining the electoral roll, election planning, readiness and delivery. We are always driving efforts to improve our enrolment and election management systems. This is designed to ensure we are planning for, and delivering, modern and secure enrolment and polling services into the future. Ageing technology that has limited capacity to adapt. A dispersed network for delivery of elections. An electoral cycle where timing can change. Supporting continual improvement through the AEC’s election readiness framework. Using lessons learned to inform future election planning and delivery. Implementing enhanced planning, training, organisational change and an ICT strategy. Designing elections for the future that are governed by lessons learned, national standards and doctrine. Implementing work priorities identified following the 2016 election at the next federal election. Determine the lessons learned methodology for the 2018–19 federal election. Identifying priorities for the next electoral cycle. Developing a business case to modernise core AEC election and roll management systems. Developing a future election design (2022 and beyond) for election preparation and delivery. Effective, efficient and mature agency-wide governance arrangements are in place with assurance processes. We are strategically focused and organisationally aligned to deliver our expected outcomes. A requirement for quality, efficiency, accountability and transparency. Compliance with the PGPA Act 2013, Privacy Act 1988 and Protective Security Policy Framework. A dynamic and complex operating environment, where strategic priorities can change quickly through an electoral cycle, yet a strategic vision for the future state of electoral administration is also required. Governance and performance expectations from the Parliament, key agencies and stakeholders must be upheld. Continuing to mature and streamline our governance arrangements, and further align governance to achieve objectives. Improving our project and program management to better work across functions. Promoting and embedding risk management and quality assurance in everything we do. Supporting a funding review of the AEC and implementing the outcomes. Completing an ICT strategic plan which aligns technology with the AEC’s business vision and supports modernisation and change. Implementing an agency risk appetite statement to define ‘acceptable risk taking’ in both day-to-day work and achieving strategic objectives. Investing in a business intelligence capability to support evidence-based decision making and electoral operations. We further professionalise electoral management and delivery. We do this through attracting, developing and retaining a professional and agile workforce. Our approach to training is centrally-led and nationally consistent. Staff at all levels have clear learning pathways. We engage with our temporary staff through the electoral cycle, continually improving and optimising recruitment and training for the temporary election workforce. Work which is driven by legislation and processes that require a high degree of precision. A regular workforce across a range of electoral activities, that surges to around 80,000 on polling day. The requirement for a professional workforce to deliver public facing electoral services. A significant investment in operational and election-related training and rehearsing for AEC staff. Attracting, recruiting and retaining a professional workforce. Investing in our human resource and IT capabilities so we understand our current and future workforce planning requirements. Increasing the role capability of staff, allowing effective movement of staff across functions. Evolving the learning culture to provide clear learning pathways for staff. Engaging with key cohorts within our temporary election workforce to build capability and understanding beyond a single election event. Delivering an AEC Human Resource Strategy covering the complete HR management cycle and embedding organisational design principles. Continuing to develop, deliver and evaluate training and development opportunities for our permanent and temporary workforce to build critical operational and professional capabilities that are appropriate to roles and levels. Developing a capability framework, and training and development strategy, to guide our approach and future investment. * Aligned to expected federal election events. We have productive and valued relationships with our stakeholders. They understand our role and our values, and uphold our reputation as an electoral management body. Our relationships with the Minister, Parliament and key agencies help us shape expectations and increase understanding of our operating environment—both our opportunities and risks. Australian democracy depends on an electoral system which operates with a high level of integrity. Policies and processes must be consistent with legislation to ensure electors, Members of Parliament, candidates and other stakeholders maintain confidence in the AEC. A complex and evolving operating environment for elections internationally. As an independent statutory authority we must provide apolitical information and advice on the operational aspects of electoral administration. Maintaining electoral integrity through legislative compliance, effective processes and successful delivery. Continuing to build our core electoral and operational expertise. Maintaining our strategic partnerships to further understand and monitor the electoral environment in Australia and internationally. Providing information and advice to the Minister, Parliament and key agencies on electoral administration and operations. Engaging and collaborating with electoral management bodies to improve systems, services and learning through knowledge sharing. Undertaking strategic engagement with developing countries and emerging democracies on electoral administration, consistent with the Australian Government’s national interest and foreign policy objectives. Our organisation quickly adapts and responds with agility and flexibility. We have the people, processes and systems to respond to changes in the electoral cycle and stakeholder and community expectations while continuing to improve our election delivery and systems. The timing of federal elections, by-elections, and Senate special counts are unknown and we must be ready to conduct these events. Balancing readiness alongside responding to other needs such as electoral roll closures for other jurisdictions. The requirement to maintain an appropriate level of election readiness and planning, balanced against other agency priorities. Extended periods of readiness are costly and resource intensive. The need to understand and operationalise changes in legislation, systems and processes on short notice and within limited timeframes. As an organisation, we expand and contract significantly throughout an electoral cycle. agile, adapting to scale up and scale down. predictive of our environment and challenges. always evolving to be responsive and election ready. Transitioning from the ‘implement change’ to ‘mobilisation’ phase of election readiness. Maintaining readiness to deliver a federal election event. Further refining our election readiness framework through lessons learned. Continue to evolve our organisational design, structure, and governance to allow increased agility in response to changes in risks and the environment. As a regulatory body we aim to reduce the regulatory burden imposed on electors through enrolment and voting services. In line with the Australian Government’s commitment to reducing the cost of unnecessary and inefficient regulation imposed on individuals, business and community organisations, we measure our performance against the regulator performance framework. This measures our performance against six mandatory key performance indicators set by the Australian Government. The following table outlines our performance against our measures of success. Support electoral participation and voting formality through communication, education and public awareness activities that inform all Australians of electoral matters. Make available timely and accurate information and services to stakeholders when carrying out their legislative responsibilities and obligations. Maintain an appropriate level of readiness to conduct a federal election event. The governance framework is effective in supporting business outcomes. Timely and accurate information and advice on electoral administration that supports the direction of the AEC. Maintain a cycle of continual improvement through the election readiness framework. Invest in and deliver strategies that increase organisational capability. Our corporate plan fits within the broader APS Performance Management Framework required under the Public Governance, Performance and Accountability Act 2013 (PGPA Act). Our corporate plan informs and draws from the Portfolio Budget Statements which define our purpose and the proposed funding allocation to achieve this. How the corporate plan fits within the broader APS performance management framework is shown in this table. is to maintain an impartial and independent electoral system for eligible voters through active electoral roll management, efficient delivery of polling services, and targeted education and public awareness programs. We report on our performance through our agency directions, outlined in our corporate plan. are our medium to long-term objectives. They guide what we do, how we prioritise and how we promote continuous improvement. Our corporate plan, updated annually, includes an assessment of our operating environment, our risks, and our capability. outlines the factors or influences that impact the operating of our agency and how we deliver our purpose. outlines potential issues or threats we need to mitigate to ensure we deliver our purpose. includes our people, processes and the systems we need to deliver our purpose. Our PBS performance criteria align with our functions in the corporate plan. See the matrix that maps this relationship is in our Portfolio Budget Statement below. enable us to deliver our purpose. enable us to deliver our functions and are guided by our agency directions. Our PBS performance targets align with our performance in the corporate plan. outlines the results and level of performance expected in meeting our agency directions, and through them, our purpose. Our Portfolio Budget Statement (PBS) outlines the AEC’s proposed allocation of resources for delivering government outcomes. Program 1.1 — To deliver electoral events. The PBS performance criteria to deliver this program are similar to the functions in the corporate plan. How the PBS performance criteria are aligned with the agency directions is shown in this matrix. Federal electoral events are successfully delivered. Maintain ability to conduct a federal electoral event within a timeframe. Timely conduct of redistribution activities. Industrial elections, protected action ballots, and Torres Strait Regional Authority elections are delivered in accordance with the relevant legislation and rules. High level of confidence in the electoral roll. Party registration processed in accordance with the Electoral Act. Financial disclosures obtained and placed on the public record in accordance with the Electoral Act. Deliver communication, education and public awareness activities to inform all Australians of electoral matters.